The were calls for the Taoiseach to put his views on abortion on the record today. Taoiseach Leo Varadkar has been accused of sending mixed messages in the abortion debate. 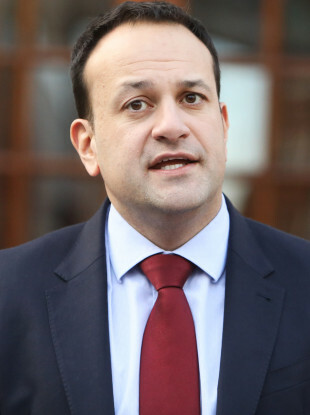 TAOISEACH LEO VARADKAR has indicated that he will make his own views known on abortion in a couple of weeks when the wording of the amendment to the Constitution has been determined. Pressure has been mounting on Varadkar to make his viewpoint known on the issues. Earlier today, both Labour and Fianna Fáil accused the Taoiseach of giving mixed messages and not showing leadership. When asked about the matter in the Dáil today, the Taoiseach explained that the government is awaiting advice on the abortion legislation from the Attorney General. Varadkar said repeal simpliciter might not remove all of the unborn’s right to life, adding that there are other rights in the Constitution that could come into play. He said the government had to consider the Citizens’ Assembly proposal that a constitutional amendment would be necessary to specify that it is only the Dáil and Seanad that has the power to legislate, and not the courts. There will be a debate in the Dáil and Seanad over the next couple of days and, at that point, having listened to the views of Members and the public, a proposal will be brought to Cabinet. It will need to have two elements, including a referendum Bill allowing for the repeal of the eighth amendment. The Government does not propose to come up with a new wording but one thing that has to be considered is the proposal of the Citizens’ Assembly to have an enabling provision specifying that legislation in this area is the sole prerogative of the Oireachtas and not the courts because there are other rights in the Constitution. He added that the government will also produce the heads of the legislation which would be brought to the Dáil should the referendum. A government spokesperson said it is still the government’s intention to put a question to the Irish people this summer by referendum. However, a number of politicians criticised the Taoiseach today, stating that the rhetoric he is using around the issue is causing “confusion”. TDs from both Fianna Fáil and Labour said the lack of clarity about his viewpoint is “undermining” the work of the all-party committee on repealing the Eighth Amendment. Last week, the Taoiseach called a press conference following the first Cabinet meeting of the new year, but refused to set out his stall on the issue, despite ministers having discussed the committee’s report at length. However, he said the proposals brought forward by the Oireachtas committee, to legislate for unrestricted abortion up to 12 weeks, may go “one step too far” for some politicians. However, he added that it might be suitable to others. A special parliamentary party meeting of Fine Gael members was held for five hours on the issue yesterday, where it emerged the Taoiseach said the committee’s recommendations were a “strong option”. Fianna Fáil’s Health spokesperson, Billy Kelleher, who sat on the Oireachtas Committee on the Eighth Amendment said today the Taoiseach was sending out mixed messages. “Over the last number of days I’m very confused and primarily that has arisen because of the Taoiseach’s comments. I’m disappointed in him truthfully,” he said. The Cork TD said he respected everyone has their own opinion, but added that he was disappointed in the Taoiseach. Our Taoiseach has to show leadership and decisiveness on this issue, one way or the other. I think that at this stage it is undermining the process. He said Varadkar had “varying views for varying strands of opinion”, adding that the Taoiseach was offering “a view that falls on different ears for different reasons”. It was pointed out to Kelleher that his own party leader, Micheál Martin, had also not yet given his view on the matter. Kelleher said Martin would make his views known in due course. In an interview with TheJournal.ie before Christmas, Martin said that he would take the holidays to read over the report and the committee’s transcripts before giving his opinion. However, he did acknowledge that there are a lot of pro-life members in the Fianna Fáil party, with many having concerns about the 12 week period set out in the committee’s report. Labour’s Brendan Howlin called on political party leaders to put their views on the record, adding that he understands that both Micheál Martin and Leo Varadkar will not be speaking during this week’s Dáil debate on abortion. This has yet to be confirmed by the two party leaders. Howlin said that would be “unfortunate”, stating that now is a time for leadership. He said all politicians have had sufficient time to read the report and all the documentation, and should be able to set out their thoughts clearly on the issue. The Labour leader agreed with Kelleher and said he was equally confused by the rhetoric of the Taoiseach in recent days, stating that it didn’t appear “that this has been carefully thought through by a working politician”. We need clarity. The all-party group made their recommendations a month ago now. We’ve all had the opportunity in some detail to read it, to reflect upon it and to discuss it with people. And we should give leadership to people now in relation to this really important issue that has been on the agenda for three decades in this country. He said the same could be said for Micheál Martin. “It is not good enough that once the debate opens in Dáil Eireann that leaders of political parties don’t give leadership,” said Howlin, who called on both leaders to put their opinions on the record of the House. Email “Taoiseach to make his own views known on abortion in a 'couple of weeks' ”. Feedback on “Taoiseach to make his own views known on abortion in a 'couple of weeks' ”.